Sarah hails from the Turkana community, the minority tribe in Laikipia county. Traditionally, this community practices cattle herding and lives a nomadic lifestyle. Many of the girls in this community face a higher risk of FGM (though the practice is illegal in Kenya) and early marriages. Most girls never complete their primary education, and those who do never progress to secondary school. Sarah is among the lucky few who has made it all the way to high school. This accomplishment has enriched her with a lot of hope and aspirations for her future. Her main goal is to complete her secondary and university education, and then help her family out of its current financial position. She hopes to pursue an entrepreneurial career in future. She is the second born of a family of 4 kids. She and her younger siblings all attend Kiriko Primary School. They live with their widowed mother who is a day laborer. Sarah’s father died in 2006 from an unknown illness. During our visit, we had to look for her mother on the nearby large-scale farm where she has been working lately to feed her family. She has no extra money to pay for her children’s secondary education. Without external help, it is certain that Sarah will either end up as a day laborer, like her mother, or end up trapped in an early marriage, like her elder sister. Help Sarah avoid this fate and make a better future for herself by sponsoring her today! 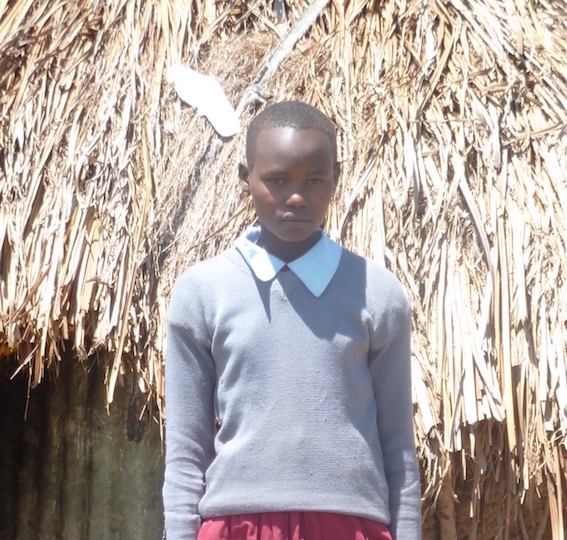 Sponsoring Sarah for secondary education is $37/month. Thank you for sponsoring Just One.